In Kanchipuram Thiru vekka, also called as "Yadhothakaari Sannadhi" which is found in Kanchi, has its own speciality and Sriman Narayanan's Anugraha (Blessings). Nearer to the Yadhothakaari temple, is found a Poigai (small pond), which is full of beautiful, fresh lotus flowers are found. Sonna Vannam Seitha perumal, is found close to this pond and giving his seva to the entire world. The Pond, which is found in the Great Ksthetram, inspite of having the nourishing smell and beauty, it has another speciality to be said. In Siddhartha year, Iyppasi Month, Suklashtami Tuesday in Tiruvona Natshatram, as an Hamsam of one of the Panjayudham (5 Weapons) of Sriman Narayanan - Thiru Sangu, Poigai Alwar was born in this world. Since, he was born in this poigai (Pond), he is called as "Poigai Alwar". _From the Childhood, his thinking was always on the almighty, Sriman Narayanan and made up his mind that he should follow him and want to spread his fame to the world. He learnt all the Vaishhava's speech and acted according to it and led his life as how a Vaishnava should be. Knowing the greatness of Thirumaals devotion and thought him fame has to be spread to all the humans in the whole world, he left all of his general human characters like Love, Angry and having the mind to earn wealth. 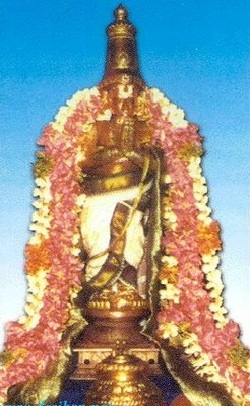 Poigai Alwar composed the first 100 verses starting with the words ' Vaiyam Tagaliya, Varkadale Neyyaaga' ( the universe being the lamp and the oceans being the lubricant). 'Samsara', I am dedicating this garland of verses. I had His vision in the light of the lamp of earth, the lubricant ghee being the waters of the ocean. The bright Sun is the one that sheds light on this." A total of 108 Tirupatis Poigai Alwar along with other Alvars consecrated of 6 temples.